Aluminum 40mm OD (outer diameter) single carb manifold with single boot and a Mikuni VM30 Carb. This Mikuni VM30 Carburetor will give the best balance of Gas Mileage and Performance. 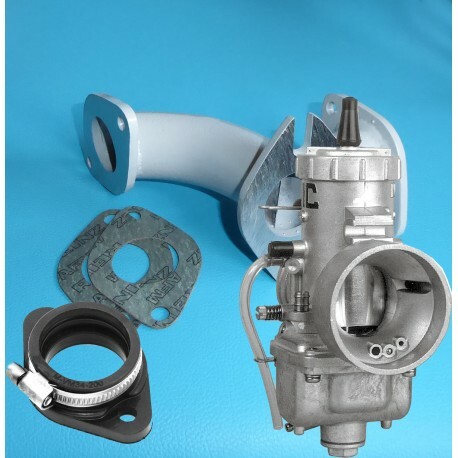 For this conversion kit with VM-30 carburetor a universal throttle cable is required. Click here to BUY the cable. Please email or respond on our web site or call us at 224-210-6030 and leave us a message with any questions. We will respond within 1 working day. 1. Install manifold on to engine. Right or left, it’s your choice.Choose the best Gasket set for your Virago and use RTV and allow the RTV to set or firm up before finish tightening Bolts.